This entry was posted on February 12, 2015 by Van Rental. I recently wrote about the problems caused by Nitrogen Oxides (NOx), a dangerous pollutant from diesel exhaust fumes. NOx emissions have been relatively unaffected by successive UK governments’ obssessions with carbon dioxide emissions, something that has of course been driven by the EU. The problem should have been addressed by the Euro 5 emissions regulations, which had lower limits for NOx. 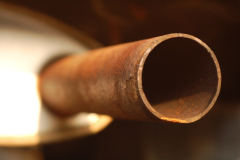 Unfortunately, lower limits on paper didn’t seem to translate into lower NOx emissions, according to a report from Transport For London, which says that Euro 5 technology didn’t work to reduce NOx emissions in urban environments*. In other words, manufacturers designed their engines to get through the Euro 5 approval tests**, but these tests didn’t represent real-life urban driving conditions. The latest European emissions standard, Euro 6, should go some way to address this problem: in addition to having lower NOx limits, Euro 6 requires emissions to be measured at a range of engine speeds and loads, simulating urban driving. In fact, according to the Society of Motor Manufacturers and Traders, a London bus fitted with Euro 6 techology emits 95% less NOx than older models. Good news, then? Well no, or at least not anytime soon. Although Euro 6 was made a requirement for heavy vehicles at the start of 2014, a loophole was provided exempting bus operators from having to buy Euro 6 buses. Unsurprisingly, bus operators have decided to stick with (cheaper) Euro 5 engines, and just 20% of buses registered last year were Euro 6-compliant models. As we’ve seen before, the government pays lip service to the importance of cutting transport emissions, but does very little to actually implement it, caving in to vested interests at every turn.